On October 10, the US Department of Homeland Security announced a change to the “public charge” rule that would make it very difficult for immigrants with disabilities to legally enter the US. It is unfair, it is discriminatory, and it will hurt people with disabilities and their families. A “public charge” is someone who the government believes will be dependent on public benefits to meet their basic survival needs. Under the current rule, someone is considered a public charge if they used cash benefits, like Social Security or TANF funds, or if they live in an institution. If a person is found to be a “public charge,” they can be denied entry to the US, or if already present, they can be deported. Medicaid, including BadgerCare Plus, IRIS, and Family Care. People with disabilities and their families often depend on programs like these to meet their basic survival needs. Approximately 10.5 million children in families receiving such public assistance have at least one non-citizen parent. Some of these services, like Medicaid-funded community services, are unavailable through private insurance. Nevertheless, this new rule will discourage low-income families from accessing these benefits because of fear that they or their family members with disabilities could be deported. Many mothers and fathers would have to choose between accepting help for basic human needs (such as food, medicine, and shelter) and keeping their families together.The new rule could also punish people with disabilities and their families who are not citizens, if they lack private insurance to pay for medical costs, are low-income, or have limited access to employment. The new rule looks at a person’s health to decide if they could become a public charge. If you have a significant disability, or certain kinds of medical conditions, that counts against you. If you have limited education, that counts against you. If you have limited employment history, that counts against you. Many people with disabilities face discrimination and disadvantages in education and employment because of their disability. Effectively, this proposed rule could exclude people with disabilities simply because they have a disability. Earlier this year, President Trump implemented guidelines that required federal authorities to separate children from their families, relatives, or other adults who attempted to immigrate to the United States. After a national and international outcry, President Trump signed an executive order suspending this policy.The new rule could make this nightmare a reality once again for immigrants with disabilities and their families. Because the new rule would deny lawful entry or residence for people with disabilities, it would effectively separate them from their families. The new rule would force those families already present to make an impossible choice between securing citizenship and accessing vital public services for their family members with disabilities. The new rule could separate children from their parents, and caretakers from their loved ones with disabilities. The Consortium for Citizens with Disabilities (CCD) strongly oppose the rule because the rule “would make it significantly harder for people with disabilities to immigrate to the U.S. or become legal permanent residents” and “would harm people with disabilities and lead many to avoid using needed benefits.” Read the Consortium for Citizens with Disabilities’ full statement. The Center for Public Representation (CPR), The Arc, and the Autistic Self-Advocacy Network (ASAN) have put out a fact sheet that explains the rule in greater depth: How the Public Charge Rule Will Hurt People with Disabilities. The “Protecting Immigrant Families” Coalition have an excellent website that not only provides information about the rule, but will allow you to submit a comment for the Trump Administration to consider when evaluating this rule: Protecting Immigrant Families. We need your help to stop this rule. Your voice matters. Step 1: Contact your legislators and tell them that you do not support this rule! Please contact your legislators to voice your opposition to the new public charge rule. 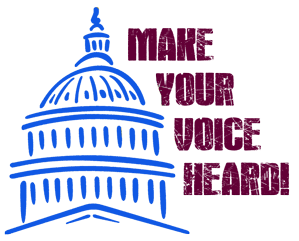 For help finding the contact information for your legislators, or tips on how to contact your legislator, check out our DRW resources page. Step 2: Submit a comment against this rule to the Trump Administration. If you want to submit a comment to the Trump Administration for consideration, please head to the Protecting Immigrant Families campaign site. Click “Submit Comment” and follow the instructions on the page. The comment box already has a pre-filled suggestion for you to use, but it is a good idea to edit the text and use your own words. It will be more meaningful to share your own experiences, stories, and perspectives to explain why this rule is such a bad idea for people with disabilities and their families. Step 3: Spread the word! Please tell your friends and family members to join us in opposing this rule. Refer them to this site at drwi.org to learn more about the public charge rule or go to the Protecting Immigrant Families comment submission form to submit a comment against the rule! The more voices they hear against the rule, the more likely it is that they will reconsider implementing it. Please help us stand for people with disabilities, no matter their immigration status or income. Tell the Trump Administration to define people with disabilities by what they can do, not what they cannot. Join the campaign to stand against this public charge rule.